It’s not easy for Dustin Byfuglien to sneak under the radar on that Winnipeg Jets blue line. After all, he’s 6-foot-5 and about 260 pounds. Yet, at the start of 2018-19, he had moved out of mind a bit for some observers. Fast forward to December and Byfuglien is firmly back in the conversation for best defenseman on the Jets. He’s on pace for his best statistical season ever, with 25 points in 26 games, and activating offensively like the Byfuglien of old. Since returning to the Jets lineup on Dec. 7, Byfuglien has nine points in six games and three games with multiple assists. His goal totals are down but considering he didn’t score until Jan. 5 against Buffalo last year, that’s not a huge concern. The offense is great for Byfuglien as it has been a calling card of his career, but the big hits have returned as well. Byfuglien is capable of rag-dolling his opponents like no one else, and few players impact the game the way he does with his hits. Then there’s the puck-rushing aspect. During the game against Chicago on Dec. 14, Byfuglien, on several occasions, carried the puck into the Blackhawks end and did a lap of the offensive zone. This allowed his linemates to get a full change in and still keep offensive zone possession. Byfuglien’s advanced statistics show a player who has consistently driven possession in his time with the team. He’s not the relatively young player he was when he came to Winnipeg, but he’s playing like a man far younger than his 33 years. The Jets defense has been a sore spot at times this year, but usually only with Byfuglien out of the lineup. As impressively as the Jets have built themselves up, few teams could easily withstand losing a player of Byfuglien’s impact. Byfuglien playing completely changes the Jets outlook on the back end, especially when he’s playing like he is at the moment. A force at both ends of the ice, he changes the tempo and feel of the game just by being part of it in a way few players in any sport can. As of this writing, Byfuglien’s 25 points put him in fifth among all NHL defensemen. It’s worth pointing out he’s played five fewer games than the leading scorer, Morgan Reilly. The power play also looks a lot different with Byfuglien back there. No disrespect to Josh Morrissey, who filled in admirably in Byfuglien’s absence and continues to be brilliant, but Byfuglien gives that power play an entirely different dynamic. #NHLJets power play clicks in five seconds. Dustin Byfuglien's point shot is deflected on the way to the net and beats Stolarz on the glove side. 4-1 Jets. The extra heavy shot, coupled with snipers Mark Scheifele and Patrik Laine, gives the Jets first power play unit an unreasonable amount of firepower. It might explain why their power play sits first in the NHL at 30.4 percent. Especially noteworthy is that, since Byfuglien returned on Dec. 7, the power play has gone 8-for-24. That includes the 0-6 run against the St. Louis Blues that night. There were no shortage of skeptics when Dustin Byfuglien signed his five-year contract extension at the age of 31. 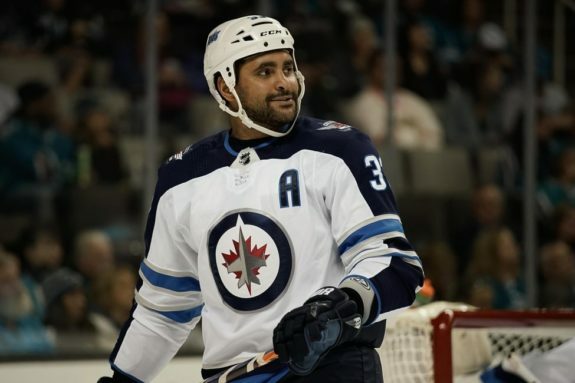 The biggest complaint, and not an unreasonable one, was that it would take Byfuglien through to the age of 36.
Who can say what Byfuglien will be doing at age 36, but at age 33 he looks as good as ever. His average annual value of $7.6 million looks easily justified. It’s hard to be a steal at that price tag, but Byfuglien is pushing that boundary. Whether Byfuglien can keep this up is anyone’s guess. He’s on pace for 77 points, which seems unsustainable, and his CF% rel is a solid 4.0 at 5-on5. That’s a lot to ask of a 33-year-old. But the Jets don’t have to look far for players that have gotten better with age. After all, captain Blake Wheeler wasn’t a point-per-game offensive force until his 30’s. He has posted his best offensive totals this year and last. You wouldn’t think Byfuglien’s style would lend itself to longevity. After all, few players hit harder or more often, and he’s not shy about blocking shots. His recent concussion was a troubling injury. The Jets should enjoy Byfuglien while he’s playing this way as he’s an utterly unique talent at his best. No player in the NHL is quite like him. No player in the Jets system, or any system, can replace him. The scariest part for the rest of the NHL (and the best part for Jets fans) is that Byfuglien has often saved his best work for the playoffs. He may be just getting started. That’s enough to give the rest of the Central Division nightmares. It’s also enough to put a smile on the face of Jets fans who, at the moment, have as much to smile about as any fanbase in the league. Add a seemingly rejuvenated Byfuglien to the Jets list of weaponry, and you’ve got a recipe for a dominant squad.